Today’s cars have an increasing number of safety features, but there’s one thing that still sits at the top of the list for ensuring you and your loved ones are safe – car brakes. Improvements over the years have made them better and longer-lasting, but if you don’t maintain them properly, then they won’t do their job. Here’s how you can properly take care of your car brakes and know when they need the attention of an experienced professional. You know they slow you down, but how do they pull off the trick? Your car brakes are made up of multiple parts that work together to slow down your car. Most modern cars used disc brakes which consist of a plate-like disc attached to the wheel. When you push the brake pedal, that disc is squeezed by a metal caliper that grabs the brake. Think of your hand grabbing the edge of a spinning plate. There is a brake pad on the inside of the caliper that is specially designed to provide friction and reduce heat buildup. The calipers have little pistons that push the brake pads against the disc to slow it down. This involves a hydraulic system that pushes brake fluid from the master cylinder to those pistons. When you press on the brake pedal, you’re creating pressure and sending that fluid to the pistons. All of these parts, from the discs to the brake fluid, need to be maintained for your car brakes to work properly. If the brake fluid is low, then pressure needed to make those little pistons work and having the calipers grab that spinning disc won’t be enough. You may feel this problem when your brake pedal goes down further than usual before the car starts to slow. You can check your brake fluid to make sure it doesn’t run low or run out resulting in brake failure. Start by checking your owners manual to find out where the brake fluid reservoir is located and read the guidelines for checking the brake fluid in your vehicle. Some anti-lock brake systems require pumping the brakes first, so find out if your vehicle has this requirement before you open the reservoir. Clean the top of the reservoir thoroughly so no dirt gets into the fluid. Dirt can cause your system to fail completely, so make sure absolutely no dirt falls into the reservoir. Once the cap is off, check to see that the fluid level is within about a half inch from the top and add more fluid if it’s too low. Brake fluid absorbs moisture so open the reservoir and fill it quickly rather than letting it sit open. While it’s open, look at the color of the fluid. If it’s dark, then you should take your car in for service to have the brake fluid replaced. A general guideline is to have it changed once every two years to prevent damaging your car brake system. Check your brakes roughly every 10,000 miles to be sure the pads aren’t worn and that the discs and calipers are in good condition. Worn brake pads announce themselves loudly with a high-pitched screeching sound. That’s the worn brake pad indicator, which is designed to make that noise as a warning. 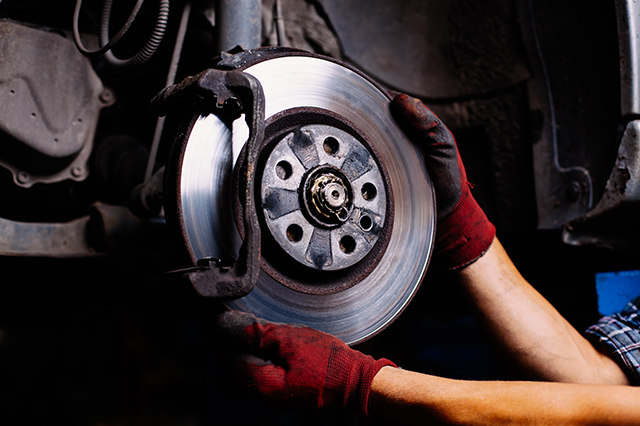 If you hear it, then take your car in to have the brakes checked as soon as possible. Although you can sometimes see your brakes through the spaces in the wheel spokes, it’s better to remove the wheel for a closer look. This is a job best done when your car hasn’t recently been driven as brakes get hot and you don’t want to burn your fingers during the inspection. Safely jack up the car and remove a front wheel. Now you have a clear view of the disc. A little rust on the disc is OK, but heavy rust requires attention from an experienced service technician. Also look for any uneven wear or scoring on the disc. A professional can tell you if the discs simply need to be reground or if it’s safer to replace them completely. Next, check the calipers. They should fit snuggly and not wiggle around when you grab them with your fingers. Lastly, check out the brake pads. You can see them through the inspection hole which is in the dust shield on the caliper. A mechanic will mount your car on a lift and measure them to ensure they’re not too thin. When they’re roughly a 3-mm thick, then it’s time to have them replaced. If you’re unsure about the thickness of your brake pads, then have a professional inspection. Lucas synthetic brake fluid dot 3 is a high quality blend of polyethylene glycol ethers and additives which meet or exceed the industry minimum dry boiling point of 401ºF. It meets the federal motor vehicle safety standard (FMVSS) no. 116 and SAE J1703 specifications. Lucas synthetic brake fluid dot 3 is recommended for use in both disc and drum brake system and clutch system where this type of product is called out for.